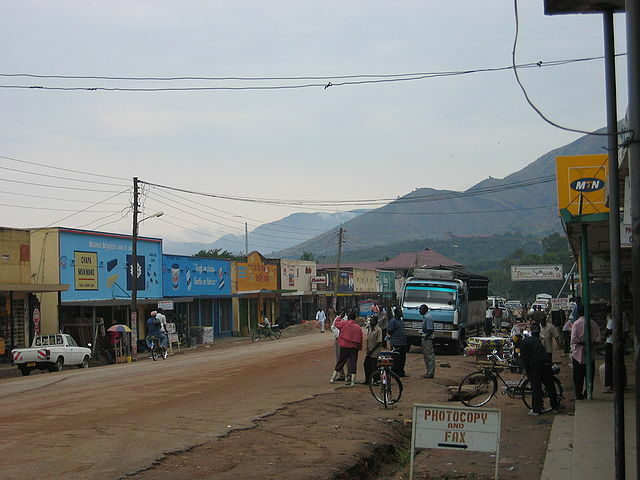 Implementation: Kasese District is located in Western Uganda. It is bordered by several protected forest reserves including Queen Elizabeth National Park and Mt. Rwenzori National Park. Only 7.6% of the 134,000 households in the district have access to the national grid. Limited road access make connecting to the grid virtually impossible. Nearly all households burn wood and charcoal as their main source of energy. Most use kerosene (also called paraffin) to light their homes. In 2012, Kasese District Council launched a 100% renewables program with the aim of bringing access to clean energy services for all domestic, productive and social needs in rural and urban areas, all by 2020. The program would ensure that renewable energy access is integral in all government-funded projects and institutions, including schools, health centres, markets and other public infrastructure. Tax breaks are made available for all renewable-energy-related businesses. Traineeships are provided for the installation, maintenance and distribution of renewable energy technologies. The council is also working with universities, businesses and NGOs to implement smaller localised RE projects. A collaboration between WWF and Barefoot Power Uganda is allowing local businesses to provide loans for small-scale solar in mountain villages. The partnership's "Light Up a Village" program has brought 240 solar home systems to Kasese. Today renewables are estimated to supply 26.8% of the Kasese district with energy. Solar for lighting and biogas for cooking has replaced the traditional three-stone method of cooking – reducing indoor pollution. Cheap domestic solar systems now provide electricity for many, freeing up money for food, clothing and education. Increasing electrification has meant more reliable lines of telecommunication that enable solar phone charging facilities and solar-run computers with internet access. The district now plans to convert its streetlights to use efficient LED lighting. The number of new businesses and jobs in the green economy has increased. Businesses sell solar equipment, maintain solar networks, build biogas systems, install modern cook stoves and construct mini-hydro projects. The tourism industry has grown as newly electrified camps and lodges are attracting more visitors. To achieve the 100% target, Kasese will still require support for the existing program and innovative finance mechanisms maintained over many years for households – especially those living on less than $1 a day.